This final call is urgent! Time is short. The end of this age approaches. Christ is coming soon! In fact, Christ is already in the process of coming. He is not getting ready to come. He is ready to come. So, we must answer His call now! “Behold, He is coming with the clouds, and every eye will see Him, even those who pierced Him; and all the tribes of the earth will mourn over Him. Even so. Amen” (Revelation 1:7). The curtain is ready to fall with finality on the theater of human history. The unfolding drama of redemption is all but complete. All that remains is the climactic return of our Lord. This final call comes with urgency because the Lord is coming back soon. So, we must answer His call now! Revelation 1:7 does not say, “He will come.” Rather it says, “He is coming.” – present tense. His coming is so imminent that He is in the process of coming. “The time is near” (Revelation 1:3). This means that the time is brief. Opportunity is short. His coming is here. The time for action is upon us. Today is the most important time in all of human history. These are the moments immediately preceding the return of Jesus Christ. When Christ does appear, His coming will be in great glory. He will be attended by the clouds, which picture all the saints dressed in white robes who accompany His return (Revelation 19:8, 14). They are the cloud of witnesses (Hebrews 12:1) now in Heaven. There are so many believers returning with Christ at His coming that they appear visually to be massive clouds rolling across the skies. Every eye will see Him. In that day, His glory will not be veiled. This time there will be no mistaking His identity. At His first coming, Christ’s glory was veiled by human flesh. But at His second coming, “they will see the son of man coming on the clouds of the sky with power and great glory” (Matthew 24:30). Because Christ’s coming is so imminent, His final call creates a sense of urgency in our hearts. Now is the time to wake up and serve Him! That’s true about Christ’s return. None of us knows the hour He is coming. But it’s later than it’s ever been before. Yet the church sleeps. Comfortably tucked in bed. Late into the night. We live as if we don’t know what time it is. We conduct our business as if His coming is a long time off. But the time is near! “I am the Alpha and Omega” says the Lord God “who is and who was and who is to come, the Almighty” (Revelation 1:8). Alpha and omega are the first and the last letters of the Greek alphabet. The beginning and the end. All letters find their place between these two. The “Alpha and the Omega” encompass the whole. No letter precedes Alpha and no letter comes after Omega. When Jesus says, “I am the Alpha and Omega He is making a claim to Deity. From A to Z, He is the beginning and the end, the one who encompasses the whole of creation. Nothing comes before Him and no one will come after Him. For from Him and through Him and to Him are all things” (Romans 11:36). Jesus Christ, the Lord God, is the one who “was,” “is” and “is to come.” He is eternally the same – past, present and future. Unchanging. Immutable. Never diminishing in His power. Ever the same, yesterday, today, and forever (Hebrews 13:8). As the Lord who is to come Jesus is the one who is about to arrive. Later in the book of Revelation , when the time finally comes for Jesus to come, He is described as the Lord God, the Almighty, who are and who was” (11:17). But “who is to come” is omitted there. Why? Because the time of Christ’s appearing will no longer be anticipatory. The time of His coming will be finally realized in that day. But today, He is the One who “is to come” He is about to arrive. Very quickly. Soon. So, we must answer His call now. Christ is also the “Almighty” – the One possessing all power. Again, this is another staggering claim for Deity. This title is used only of God and Christ. Never of a man. There is no power in the universe outside of Christ. There is nothing He cannot do, because there are no boundaries to His power. The hour is late in America! Night has come to the world. Darkness is draped across the land. Jesus is soon to come, “as a thief in the night” (I Thessalonians 5:2) The church must be ready. It’s midnight again. PRAY FOR THE WORK THAT GOD IS DOING THROUGH US IN CUBA! As I write this we are leaving today to preach at RiverLife Church in Pearl River, Louisiana with our good friends, Pastors Mike and Kris Lairsey. After those special revival services we will fly out of New Orleans to Cuba for our evangelistic crusades, Bible distribution and Hurricane Irma Relief. We will be ministering there October 31 through November 6. We are believing God for a tremendous harvest of souls while we are there. It is such an honor to be used of God to be able to put Bibles into the hands of thousands of people that are receiving their very first Bible! Please pray for a harvest of young people and adults as we preach the Gospel of Jesus Christ! Pray for God’s protection and His favor. 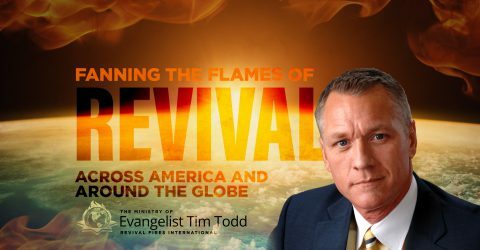 To help us with the work God is doing in Cuba through the ministry of Revival Fires you may CLICK HERE! Thank you for your prayers and thank you for giving! PRAY FOR THE WORK THAT GOD IS DOING THROUGH THE DISTRIBUTION OF THE TRUTH FOR YOUTH BIBLE! Please pray with us as we continue to bring the message of the Gospel to America’s youth and counter the ill effect of the liberal agenda being promoted aggressively in America’s public schools as we continue to provide Truth for Youth Bibles for every teenager in the United States. The Truth for Youth is given to every teenager who commits to give the Bibles to their unsaved friends in school. Over 2.5 million Truth for Youth have already been distributed and thousands of young people are receiving Christ through these efforts! One goal for giving the Truth for Youth to teenagers is to restore religious freedoms in public school. The main goal of the Truth for Youth, however, is to bring the message of the Gospel to America’s young people so they might receive Christ and become His disciples. REVIVAL FIRES INTERNATIONAL HAS MADE IT A TOP PRIORITY TO REACH THE 53.8 MILLION YOUTH IN AMERICA’S PUBLIC SCHOOLS WITH THE TRUTH OF GOD’S WORD! YOUR PRAYERS FOR THIS VITALLY IMPORTANT CAMPAIGN TO REACH THE YOUTH OF AMERICA IS GREATLY APPRECIATED! To give to help us give Truth for Youth Bibles to the young people across America or to order Truth for Youth Bibles to distribute in your community you may CLICK HERE. HAPPY THANKSGIVING FROM THE TIM TODD FAMILY TO YOURS! My prayer for you is that God will bless you and your family in epidemic proportion! We love and appreciate you! !